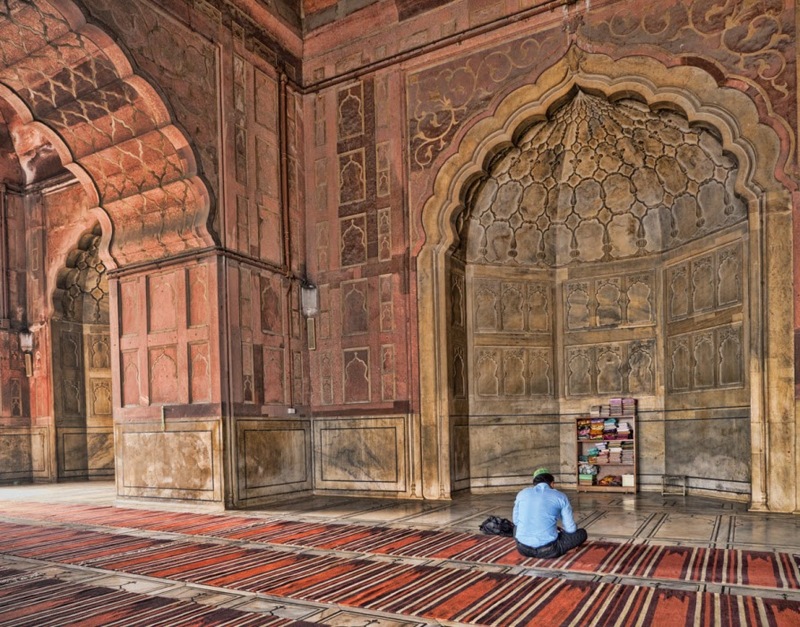 Jama-Masjid is another example for magnificent architecture of Mughals. Construction of Jama masjid started in the year 1644 and the construction got completed in the year 1656. It was built by the Mughal emperor Shah Jahan. After the death of his beloved wife, Shah Jahan decided to shift his capital from Agra to Delhi, at that time he constructed the walled city called as Shahjahanbad and commissioned to construct Jama Masjid. It costed Shah Jahan nearly 1 million Indian rupees at that time. Jama Masjid was inaugurated by the imam of Uzbekistan. The mosque consists of three gates four towers and two 40m high minarets. The construction of the mosque is done with red sand stone and marble. Located in old Delhi of Chawri bazaar, Jama Masjid is considered as one of the largest mosque in India. Today, the masjid is maintained jointly by the Delhi wakf board and the Jama Masjid committee under the instructions from Shahi Imam. 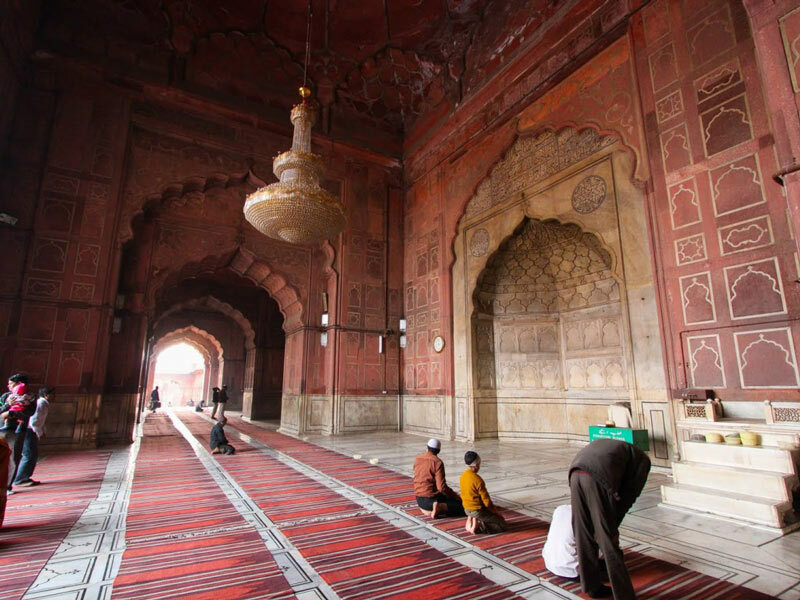 The main architect of Jama Masjid mosque was Ustad Khalil. Around 5000 workers were involved to complete this work. Facing towards Mecca (west) Jama Masjid consists of 3 gates. This huge impressive elevated mosque has steps from all sides. On the eastern side which serves as a main entrance has 35 steps, the northern gate has 39 steps and the southern side has 33 steps. The eastern gate remains closed on weekdays. The mosque is built on a stone platform which has a wide open space which can accommodate close to 25,000 worshippers. It consists of two 40m high minarets and four towers built from the strips of red sandstone and white marble. The mosque itself is about 270m in height and 30 feet wide. The minarets have five storeys along with balcony. The beauty of this minaret is that the first three storeys are constructed in red sand stone, fourth is done in marble and the last is done with sand stone. The roof of the mosque has three domes in that the central dome is the largest dome. These domes are constructed with black and white marbles along with a gold adornment. Calligraphic inscriptions adorn the beauty of the mosque on arches under the domes and many more places. At the centre of the courtyard there is a place to wash hands, legs before entering the main prayer hall. The cabinet located on the northern gate has collection of relics of Mohammed and the Quran written on the deer skin. It also consists of red beard and hair of a Mohamed prophet, his sandals, and foot prints being implanted on the marble block. 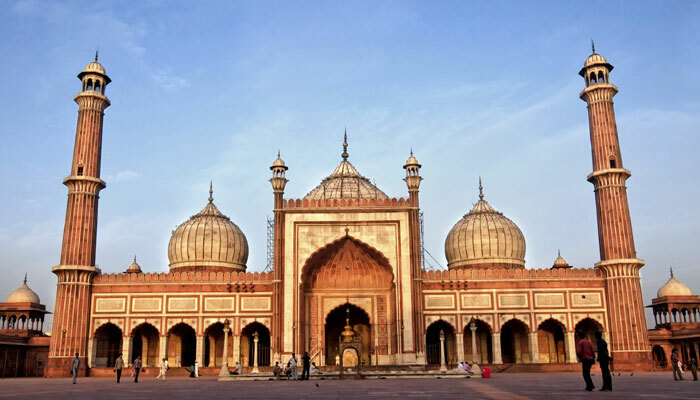 The most beautiful and breath taking Jama Masjid mosque is a must visit place for all people visiting Delhi and even for the local residents of Delhi. One can see an impressive architecture of Mughal dynasty in this mosque. Visiting hours: 7am-12noon, 1:30pm-6:30pm on all days. Nearby metro station: Chawri Bazar metro station.